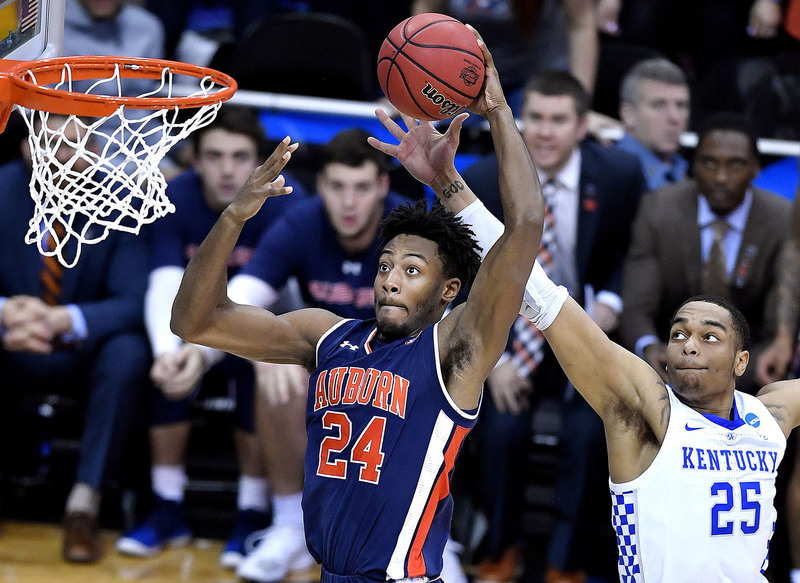 The Auburn University men’s basketball team had a prolific run this year, making it to the Final Four, but lost to the national champs, UVA (Photograph courtesy of Rich Sugg/Kansas City Star/TNS). The Auburn University Tigers men’s basketball team is coming off their most successful season ever, reaching the Final Four for the first time in school history. When you think of Auburn, you rarely think of their basketball program, but rather the football powerhouse that has produced talents such as NFL MVP Cam Newton and legendary running back Bo Jackson. The men’s basketball program has produced talent in the past, including Naismith Memorial Basketball Hall of Famer Charles Barkley but has struggled since the turn of the century. Following a Sweet Sixteen appearance in 2003, the Tigers would not find themselves back in the tournament at all for another 15 years. Auburn returned to the NCAA tournament in 2018 as a four seed, this time led by head coach Bruce Pearl. The team defeated 13th seed College of Charleston Cougars in the first round but fell to the Clemson University Tigers in the second round. But things looked bright for the Tigers heading into the 2019 season, with much of the team’s key contributors returning including sophomore Chuma Okeke, senior Bryce Brown and junior Jared Harper. The team started out strong going 10-1 to kick off the season, with their only loss being to the Duke University Blue Devils. The team would finish the regular season at 22-9 and entered the SEC tournament as the fifth seed. Auburn defeated University of Missouri, University of South Carolina and University of Florida to reach the championship. Once they claimed their spot, the Tigers defeated the University of Tennessee Volunteers 84-64 to earn their first SEC championship since 1985. Brown scored 19 points in the championship and was named tournament MVP. Auburn was awarded the fifth seed in the Midwest region in the NCAA Men’s Division I Basketball Tournament. The team almost went home in the opening round following a scare against the 12th seed New Mexico State Aggies, but moved onto the next round following a 78-77 win. In the next round, Auburn faced the 4th seed University of Kansas Jayhawks. Duke University redshirt junior Dedric Lawson scored 25 points in the matchup but was outmatched by Brown. Brown scored 25 points while shooting 7-11 from deep to lead the Tigers to an 89-75 win. In the Sweet Sixteen, the Tigers faced a mighty foe in the number one seed University of North Carolina at Chapel Hill Tarheels. Auburn went on an offensive outburst to defeat the Tar Heels, dropping 97 points, the most points by any team in the tournament. The team sunk 17 3-pointers and Okeke posted 20 points to put Auburn in their first Elite Eight since 1986. Up next was a rematch against the University of Kentucky Wildcats. Auburn had lost previous matchups against Kentucky earlier in the season, including getting blown out 80-53 Feb. 23. This time the Tigers wouldn’t go down so easily, matching Kentucky bucket for bucket all game. With under a minute remaining, a clutch driving layup from Harper tied the game at 60, and key defense from Auburn forced the game into overtime. Harper had 12 points in a high scoring overtime period, while Auburn dominated in the paint to seal the 77-71 victory, sending the Tigers to their first Final Four in history. It was another battle for the Tigers in the Final Four, facing off with the No. 1 University of Virginia Cavaliers. Towards the end of the second half, the Cavaliers were up 57-47 following a 3-pointer from junior Ty Jerome. Later, Auburn would rattle off 14 straight unanswered points, including three 3-pointers from Brown to take back the 61-57 lead. A 3-pointer from Virginia junior Kyle Guy cut the lead to one. Harper sank one of two at the line, but Virginia still had a chance to win it with 1.5 seconds. The ball was inbounded to Guy on the corner, who shot a deep three that rimmed out on the whistle. The controversial call gave Guy three free-throws, which he nailed to give the Cavaliers the 73-72 win. It was a tough end of the season for the Tigers with this heartbreaking loss to UVA. Despite a bitter end to the season, it was one for the books for Auburn. Next season brings big changes to Auburn, with multiple key players from this tournament not returning. Jared Harper will forgo his senior season and enter the NBA Draft with his teammate Bryce Brown. Next season, Auburn will look to defend their SEC Championship and continue to pursue their first national title.